Every now and then, I come across this $25 paper money. Recently my sister managed to get a few pieces for me. I had a few but my stocks dwindled down when I left MOF one and a half year ago. This $25 note was issued to commemorate His Majesty's 25th Anniversary of ascending the throne in 1992. His Majesty ascended the throne in 1967 when his father, Sultan Haji Omar Ali Saifuddin Saadul Khairi Waddien abdicated the throne. 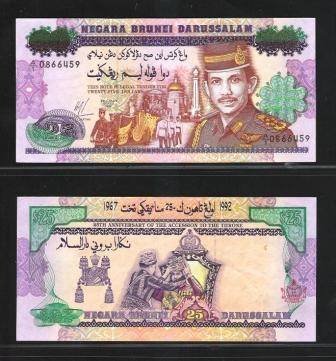 On the front of the note, you can see the royal chariot which was used by His Majesty during his coronation as the Sultan and Yang Di-Pertuan of Brunei Darussalam in 1968. The chariot is the master show at the Royal Regalia Museum in Bandar. At the back of the note, you can see His Majesty being crowned by his father. This $25 note is worth around US$30 for uncirculated notes. My sister bought this for me at an auction for my birthday present. The miniature sheet and a set of stamps came together in one nice presentation package with the word Space on the front cover and a detailed explanation of Mars statistics. I was not sure which year this is as I don't collect Australian stamps either. When I heard the price, I thought she overpaid for it but then it was for charity, so I guess it is okay. Anyway, I checked the stamps out. It was issued in 2000 but I am not sure what the occasion was. If there is anyone out there who can tell me more about these stamps, I would be most happy to hear from you.